The key to a successful campaign is monitoring its performance, tracking, and optimizing. Below you can find which aspects are important to monitor, once the campaign has been started. On the Dashboard you can find an overview of all your campaigns. To see details of a specific campaign, just click the campaign name. Invent. : if you are buying standard or premium traffic. Name: the name of the campaign, which is clickable to access the dashboard for that campaign. Geo: Which countries the campaign is running in. Redirects: The amount of traffic that a given campaign received. 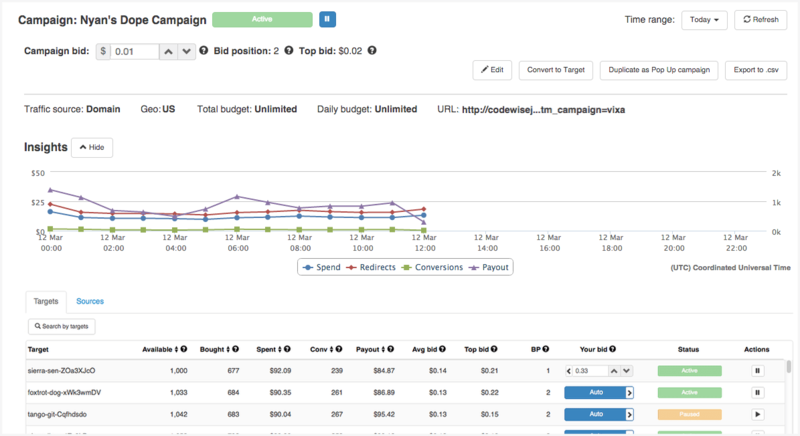 Spend: The amount you spent on traffic for a given campaign. Conv: The number of conversions for a given campaign. Payout: The amount of payout that has been given for conversions. Your bid: How much you are bidding on the campaign CPM. Status: It presents the status of your campaign. Visibility: Indicates how visible the campaign is to the demographics you are targeting. The more dots you have the higher the percentage of traffic you are buying. Zeropark Note: Keep in mind that traffic and spend data is shown for the selected time range. In the campaign details, you will find the exact sources of traffic you are bidding on with their current prices (bid per redirect), the number of redirects purchased, and the total cost. Keep an eye on the “Available” column, which shows you the number of auction your campaign bade on. This is a valuable insight into the potential of a given source or target, helping you determine an upscaling strategy. Entering the details of those campaign types, you will see a list of specific targets / sources that contribute to your campaign. There is an information on how much traffic you received from each target, your total spend per target, as well as the average price per redirect from each target. You can also see a section above the rules called Optimisation Rules. This allows you to partially automate the optimisation of your campaigns. Read this article to find out more. The Keywords tab shows a list of keywords that have contributed traffic to your campaign. You will see how much traffic you have received from each keyword, your total spend per keyword, as well as the average price per redirect from each keyword. The Sources tab shows a list of sources which have contributed traffic to your selected keywords. Tracking your campings by the source allows you to optimize by pausing big groups of targets without pausing the keyword. Zeropark Note: Each keyword gathers traffic from multiple sources. The Targets tab shows a list of targets that have contributed traffic to your selected keywords. Tracking your campaigns by the target allows you to optimize your keyword campaigns without pausing the keyword. Zeropark Note: Each keyword is composed of one or multiple targets. The Countries tab shows a list of countries that have contributed traffic to your campaign. You will see how much traffic you have received from each country, your total spend per country, as well as the average price per redirect from each country. The Sources tab shows a list of sources which have contributed traffic to your selected countries. Tracking your campings by the source allows you to optimize by pausing big groups of targets without pausing the country. Zeropark Note: Each country gathers traffic from multiple sources. The Targets tab shows a list of targets that have contributed traffic to your selected countries. Tracking your campaigns by the target allows you to optimize your Multi-Geo campaigns without pausing whole keywords. Zeropark Note: Each country is composed of one or multiple targets.